Welcome to 1980's Japan, the setting for Sega's upcoming Yakuza prequel! The economic bubble of the mid to late 80's will be playing a central role in both the plot and gameplay of Yakuza 0. Money has always been a key factor in the Yakuza series and will hold even more power in Yakuza 0, especially with the setting and increased focus on business management mechanics (according to the panel at TGS). Money will also maintain the purchasing power for your character's stats and skills upgrades. One of the key money-making mechanics has gone through a big change: money will now start flying out of your opponents as you beat them up, rather than having to wait until the end of the fight to collect it. The story will follow 20 year-old Kiryu, who will be competing in Kamurocho’s real-estate market, against the financial power of five billionaires, in an effort to exert influence over the district. As evidenced by gameplay footage, simulation aspects will be central to the business gameplay - allowing Kiryu to systematically gain control over the area. At the same time 24 year-old Majima will be running a hostess club, a concept that will be familiar to fans of Yakuza 4 as the mechanics will remain very similar. Players will have the ability to customize their club's appearance as well as hire girls off the street. 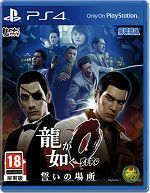 Players will be able to assume the roles of both Kiryu and Majima. The game also includes over 100 sidequests which are said to play a critical role in your overall playthrough. The quests will provide you with another source of money as well as recruit bodies for your crime empire!